According to a new national survey from Ottawa-based Abacus Data, little has changed three weeks out from the last federal election and Canadians are generally satisfied with the different election outcomes for Canada’s five major parties. Nationally, the Conservative Party was the choice of 40% of decided voters while 33% of Canadians said they would vote NDP. The Liberal Party was at 16%, followed by the Bloc Quebecois at 6% and the Green Party at 5%. “The federal political landscape has changed very little from election day in early May,” said David Coletto, CEO of Abacus Data. “All the major parties have the support of roughly the same percentage of Canadians as they did on May 2. 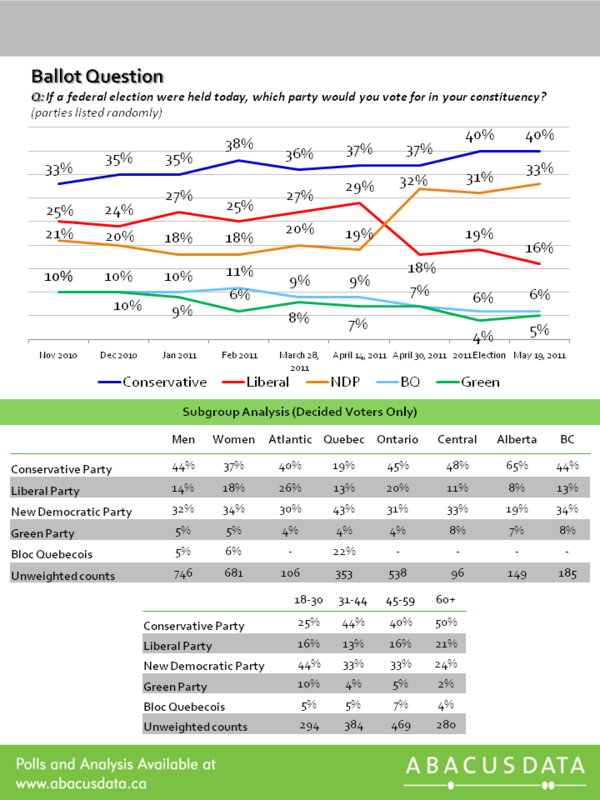 In Ontario, the Conservatives are well up on the NDP with 45% of decided voters saying they would vote Conservative. The NDP was at 31% while the Liberals are well back at 20%. Despite some controversy about its newly elected MPs, the NDP continues to hold a big lead in Quebec, earning the support of 43% of decided voters. The Bloc Quebecois is well back at 22% with the Conservative Party at 19% and the Liberal Party at 13%. Respondents were also asked to rate how satisfied or unsatisfied they were with the results achieved by each of the major five parties. Not surprisingly, the Conservative Party continues to polarize the electorate with 46% of respondents saying they were satisfied with the Conservatives winning a majority government and 41% saying they were unsatisfied. The good news for the Conservative Party is that 50% of Ontario respondents said they were satisfied with the party’s result. Respondents were more satisfied with the NDP becoming the Official Opposition in the House of Commons. Sixty-one percent (61%) were either very or somewhat satisfied with the outcome with only 18% saying they were unsatisfied. Even among Conservative Party supporters, there was a sense of satisfaction with 53% saying they are either very or somewhat satisfied with Jack Layton’s move into Stornaway. The Liberal Party’s fall to third place in the House of Commons was greeted with some satisfaction as 51% of respondents were satisfied, 25% were neither satisfied nor unsatisfied, and 23% were unsatisfied. The best news for most Canadians surveyed was the Bloc Quebecois collapse from 47 seats to 4 seats in the House of Commons. Sixty-nine percent (69%) of respondents were either vey or somewhat satisfied with the BQ loosing official party status in the House of Commons. Even in Quebec, 47% were satisfied with 32% saying they were unsatisfied. “Apart from the polarization caused by the Conservative Party’s majority win, most Canadians are satisfied with the make-up of the House of Commons,” said Coletto.